Architecture, Engineering and Construction (AEC) faces perhaps the biggest challenges of any industry every time it embarks on a new project. Each project is unique, with a unique set of challenges. Projects in AEC don’t conform to a one-size-fits-all approach, they require flexibility and adaptability. In recent years, there has been a growing trend for projects to require multidisciplinary collaboration around the globe. Often the players involved – and there are many of them – have never met or worked together before. They might not even share a common language. Even the equipment and components used may be from a variety of countries. We all know the problems of getting such a disparate, eclectic team of strangers to work together effectively. The depressing ‘domino effect’ whereby one small human error or a single amend to the design can set off a chain reaction of additional costs, missed deadlines and wasted resources. And the later things change, the worse the impact. If a project is to be a success, creating an inspiring, practical place to live or work that’s on time and on budget, meeting the highest possible quality standards, everyone must collaborate seamlessly and efficiently as a tight-knit team. Unfortunately, in most cases, that has not been happening. For example, construction is one of the only industries where efficiency and productivity has fallen over the past 60 years. Indeed, according to the article ‘Focusing on process over product: a new approach to construction productivity’, waste across construction sites stands at a startling 30%. For a long time, construction managers have focused on the transformation rather than the flow of activities. This has led to uncertain flow processes, increased upstream variability, expansion of non-value-adding activities, and reduction of output value. In the construction industry, the understanding of 'waste' has been typically limited to the physical quantity of waste of materials on site. But there is a bigger, more inclusive picture. In their attempt to enhance the industry's performance, researchers and professional practitioners, especially within the lean construction community, have looked at the manufacturing industry as a point of reference and as a potential source of innovation. In particular, for lean thinking and production principles. From a lean production perspective, the activities in the physics of production flow are twofold: value adding and non-value adding. In this context, ‘value’ means the fulfilment of customer requirements. Indeed, according to the article ‘The concept of waste as understood in lean construction’ by Saad Sarhan, waste can be simply defined as “anything that is not required to create value for the customer/client or end-user”. The article ‘Focusing on process over product: a new approach to construction productivity’ explains how to move away from the vertical, wasteful and repetitious way of working by using inclusive software solutions that integrate the roles of all stakeholders. The article explains the industry trends; Design for Fabrication, Design for Delivery, and Design for Manufacturing and Assembly. Concluding that, by following the trends, AEC stakeholders can break down silos, consequently enabling tomorrow’s AEC professionals to manufacture the most complex projects more efficiently than ever. Expanding authorship in the post-digital era requires more than reproducing traditional workflows in digital form. It requires software platforms that adaptively integrate diverse sets of information, tools, and workflows. It requires platforms that enable new ways of working. Simplification via unification is the key. For example, think of your last project and then think of a single element within it – such as a simple column in a building. Given old style (often current) industry working practices, this one element would be modeled five separate times by five different professionals: the architect; the structural engineer; the structural detailer; the builder, and the facility manager. Now think of that unnecessary replication as the metaphor for the way our industry should not be working. These days, with the technology we have available, there should only be one model of the column – available to all stakeholders, featuring all the details and data that everybody needs to do their job. Equally important, the model should be updated in real-time, so whenever a project stakeholder looks at the column on their screen they are seeing the very latest representation of how it will be, in appropriate professional terms that they can understand. The industry must recognize that the old craft-based relationship between cost and time, on one hand, and scope and quality on the other, is no longer fit for purpose. We need to find a way of doing more and better, for less. The problem is that many players seem to passively – and wrongly – accept that Quality x Scope = Cost x Time. First, we must understand that cost and time are not desirable elements of project delivery. In fact, they are the limits that determine how much quality and scope a built environment project can obtain. It follows that the industry challenge is to help project delivery professionals increase quality and scope disproportionately to cost and time consumed. To achieve that we must break down the barriers between thinkers and makers. Between those who design and those who construct. Current processes prevent us from sharing information and wisdom when it matters most. In short, we require a level platform on which both can work to simplify production and diversify consumption – applying collective experiences that reach beyond our craft silos to capture opportunities and ideas from wherever we need them. We should also find a way to reduce the cost of inevitable design changes. It doesn’t matter what the cause is: it could be the whim of a client, a late architectural addition or simply a cut in the budget. Minor changes to project geometry can trigger substantial redesign work across the project team. So, how do we make change positive rather than negative? The dream is to bring all stakeholders together to play as one unified, winning team – empowering them with the knowledge to resolve problems before they become issues. To change designs and even flag up construction snags before a single brick has been laid, ensuring that every single person involved can see in real-time exactly how even the smallest alteration will impact on their role. All in less time than was previously possible. 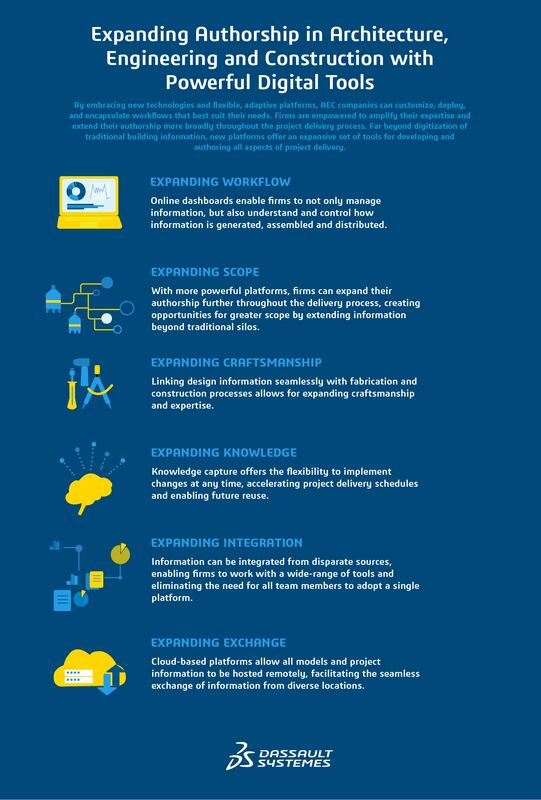 Modernizing design, engineering and construction technology provides AEC professionals with online platforms, automation, plus collective knowledge and know-how. Cloud-based platforms let project participants create pervasive online networks where information exchange can happen without friction or geographical constraints and allow digital models to seamlessly absorb new project information. Automation empowers professionals to imbed judgment into algorithms and templates, reducing the cost of changes throughout the entire project delivery process, and enabling future reuse. What’s more, by using automation, design and production can be seamlessly linked to digital manufacturing to deliver higher quality in less time, for less money. Collective knowledge and know-how accumulated by connected online environments permit all disciplines to address project challenges while feeding further automation, integration and the reciprocation of ideas. For example, the capability to predict perfectly – and confidently – material quantities, construction sequencing, and project costs from the earliest project stages. “The A. Zahner Company is setting the example for how early insight from fabricators and installers, and an integrated supply chain, can significantly reduce rework on highly complex projects. They explain the Dassault Systèmes Customer Stories about this leading American architectural engineering, manufacturing and construction firm. We rely heavily on dashboards during our coordination meetings with architects, owners and designers. The use of parametric design is growing and with it the complexity of buildings. Toshiki Meijo, Chief of the Design Division at the Japanese architectural design firm, Kengo Kuma & Associates (KKAA), has first-hand experience of this: “As projects got larger and more complex, so did the challenges,” he explained when interviewed for Dassault Systèmes Customer Stories. I’m excited about using 3DEXPERIENCE on the cloud to share information and expertise. It makes it so much easier to roll out Kengo Kuma’s vision across our entire organization. KKAA’s offices are expanding, taking on large-scale projects with greater regularity, including more public-sector work. With that growth, however, comes another challenge: making sure that the diverse range of projects retains the essence of the ’Kengo Kuma’ design philosophy. Although they represent two different disciplines within AEC, both KKAA and Zahner just want one thing: to do what they do best without hindrance. They know that only by working together with the latest technological tools can the industry create the very finest in architecture, engineering and construction. Not just making the impossible possible but making it affordable too.